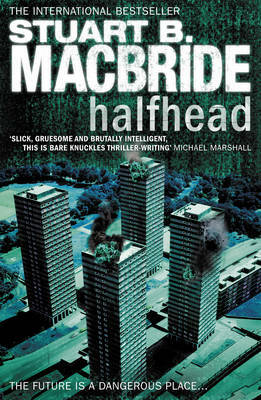 In a book written before the Logan McRae series, Stuart MacBride writes about Glasgow in the near future. The bulk of the population live in massive tower blocks with little in their lives other than VR - virtual reality programs to keep them quiet. Law breakers are subject to a process known as halfheading; a gruesome process where the lower jaw of the criminal is surgically removed along with a lobotomy. The criminals are then put to work cleaning the towers blocks and hospitals as a warning that crime doesn't pay, and also acting as a deterrent to criminal behaviour. The novel starts with Dr Fiona Westfield, a mass killer halfheaded some six years earlier, who 'wakes up' surrounded by the butchered remains of a man she has just brutally killed. Will Hunter, Assistant Section Director of the 'Network' (the military wing of the police) is called to investigate this murder and he sees a scene that he recognizes from his previous investigations. The location of the murder is Sherman House, one of four massive tower blocks called Monstrosity Square housing over 60,000 people. During the investigation of the crime scene, Hunter and his team, including Detective Sergeant Josephine (Jo) Cameron a Bluecoat secondment, end up in a fight with the local inhabitants. Knowing that Dr Westfield had been halfheaded, Will needs to find out who the killer is and continues to investigate Sherman House, the scene of a previous mass riot in Will's past. Will whose wife was killed by one of Dr Westfield's protégés is thinking it is time that he dated again - and Jo is just what he is looking for. During a visit to Sherman House, Will and Jo are taken by a group of militants to the mysterious Ken Peitai and his boss Tokumu Kikan who say that they are developing a drug to overcome VR syndrome which is the reason behind the riots. As the number of brutal killings continue, Will tries to find out what is happening but when he tries to trace Peitai and Kikan, they seem not to exist (other than for a large money transfer some years earlier). Meanwhile, Dr Westfield, as she continues to wake from her lobotomy, is out for revenge on those who brought her down and halfheaded her - Will Hunter and the surgeon who performed the operation. This novel is fairly graphic in its portrayal of the future and the violence that seems to part of everyday life. MacBride has produced a crime novel that is likely to appeal to Sci-Fi and Tartan Noir fans alike. If you are familiar with his work, this is going to be of great interest – just don't forget – this is not the next in the Logan MacRae series set in Aberdeen. Given the strength of the characters developed here, I can only hope that Stuart revisits the future in another standalone novel (he is planning to write two over the next few years). Read another review of HALFHEAD.